The behavior and properties of macroscale objects are stable and predictable because they are the result of the average behavior of very large numbers of atoms. However, as the size of the objects approaches the nanoscale, randomness emerges as a fundamental characteristic, with thermal noise, small-number statistics, and even quantum noise playing an increasingly important role. The overall aim of this project is to develop experimental and theoretical tools for measurement, analysis and control of random processes in nanoscale systems, and to improve upon traditional methods by establishing real-time, non-invasive measurement techniques with single-particle sensitivity. We focus on engineered particles in liquid environments, with the particular goal of using optical methods to make in situ measurements of the size, shape, mechanical, and transport properties of individual nanoscale objects. In liquids, the behavior of a nanoparticle results from a complex interplay of fluid flow, external and internal forces, and random Brownian motion. The goal of this project is to measure the in situ static and dynamic properties of individual nanoparticles in this noisy, fluctuating environment. Many traditional tools such as atomic force microscopy and electron microscopy are not well-suited to this task, particularly because of their difficulties making measurements on freely moving particles deep in solution. Optical methods are more closely suited to this problem, but many existing techniques cannot probe individual particles, or cannot do so at fast time scales or for moving particles. For example, a widespread method for measuring particle size, transport properties, and chemical kinetics is fluorescence correlation spectroscopy (FCS), wherein fluorescence fluctuations are recorded and analyzed as molecules randomly diffuse into and out of the small (micrometer-scale) observation volume of a diffraction-limited optical microscope. This method is simple, sensitive, and robust, making it a vital tool in physics, chemistry, and biology. However, it cannot be used to characterize the properties of an individual molecule or nanoparticle - a typical FCS measurement is averaged over hundreds or thousands of individual molecules, at the cost of abandoning single-molecule sensitivity. Another widely used method is single-particle tracking, in which individual fluorescent particle images are recorded using an optical microscope. This method is simple and useful, but the method is inherently restricted to two-dimensional motions and the sensitive cameras required to monitor single particles are too slow to monitor rapid inter- and intra-particle motions such as rotation, mechanical deformation, or fast chemical binding (See also Optimal Diffusion Coefficient Estimation in Single-Particle Tracking). In this project, we utilize a new experimental technique that allows high spatial- and temporal-resolution optical measurements to be made on individual particles moving freely in their native environment. Instead of averaging over a large ensemble of molecules, we instead use feedback control to lock a moving particle to the observation volume of our microscope using real-time control electronics to actuate a piezoelectric sample stage. This technique vastly increases our observation times, leading to a corresponding large enhancement of measurement resolution. This new method has all the advantages of traditional FCS, such as high time resolution and sensitivity to chemical activity and mechanical dynamics, with the additional benefit of providing three-dimensional position information - all on an individual particle measured in situ. 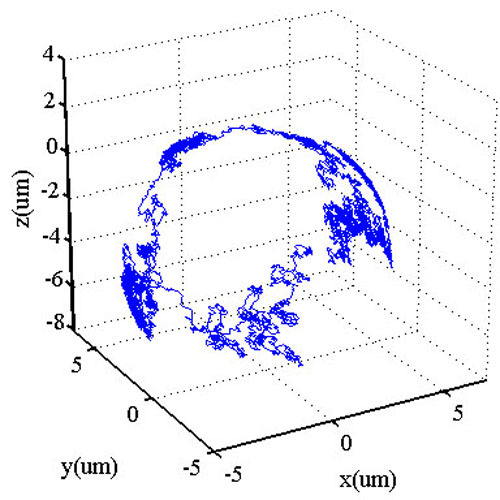 Figure 1 Three-dimensional trajectory of a 200 nm polystyrene particle diffusing on the spherical surface of an oil-microdroplet in aqueous solution. An example of the capability for three-dimensional tracking is shown in Figure 1, where a 200 nm polystyrene sphere is monitored as it diffuses at the oil-water interface of an oil microdroplet in aqueous solution. By recording such trajectories, we can extract the diffusion coefficient and infer the drag force experience by particles at the oil-water interface. Additional experiments are underway to expand our "toolbox" to include other types of fluorescent probes with sensitivity to local environment, particle orientation, and external fields. Three-dimensional real-time tracking of nanoparticles at an oil–water interface, K. Du, J. A. Liddle, and A. J. Berglund, Langmuir 28, 9181–9188 (2012).